Are your current electrical outlets living up to their full potential? We’re all familiar with the basic electrical outlet, a modern convenience for more than a century. Not much has changed in the past few decades, but recent technological advancements have made electrical outlets even more useful than ever before! How? 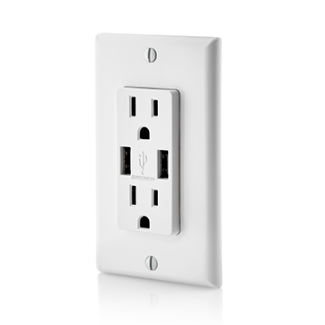 USB charging ports built into the outlet now allow you to charge devices, while leaving the receptacles open. The USB ports are positioned vertically, providing more room for maneuverability and placing less stress on the cables. While the process may seem simple enough, replacing your current outlets with USB outlets may be a bit more than the everyday homeowner wants to tackle themselves. If you’re not comfortable or confident working with electricity, call in the professionals and sleep easy. While they’re inexpensive, it’s doubtful that you’ll want to replace every existing outlet in your home with a USB wall outlet. Map out your home and decide where these outlets would be most beneficial. Kitchens, bedrooms and home offices are the most logical and practical rooms to install USB outlets. While they may cost more than a standard replacement outlet (or even a replacement charger), the convenience factor USB outlets offer is hard to ignore. If you’d like to modernize your outlets, contact your electrical pros at Milton Electric. We’ll be happy to recommend specific models for your home and can safely and efficiently install your new USB outlets in no time!